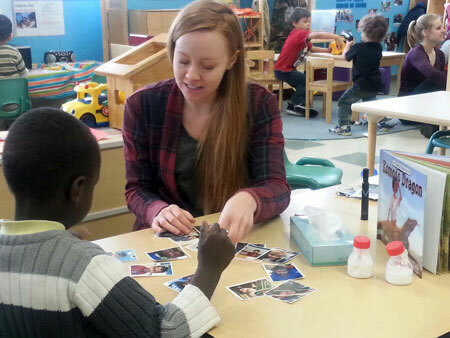 SMIF AmeriCorps LEAP member Sarah Fitch is currently in her second year of service at Three Rivers Community Action Preschool in Northfield. She shares her thoughts on challenges and rewards of preparing our youngest generation for kindergarten from her first year of service. 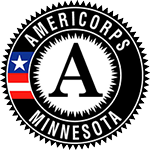 Learn how you can become a member by emailing Barbara Gunderson, SMIF's AmeriCorps LEAP Director at barbarag@smifoundation.org. When I reflect on the past seven months, I feel grateful for the opportunity I’ve had to serve the community of Northfield, MN. Upon arrival here in January, I was excited to see what I would learn about myself and what I could teach and give to this quaint yet sophisticated town. In my first week of service I had the privilege to meet the fellow LEAP members. This was inspiring and encouraging. This team was really working together and genuinely cared about the cause of this program. It was reassuring to know I could reach out to them for questions and support. The exchange of ideas was quite helpful as well. In the beginning of my service term I was a bit unsure of how I was going to teach the children social emotional skills. Teaching them to use their breath to self-regulate was definitely in the forefront of my mind as this is something I do in my daily life. It’s almost miraculous to me that we can get so caught up in emotions and stuck on “mind trains” (when you “can’t stop” thinking about something) you can bring attention to the breath and watch it all go away. Then you can come back to the present moment and abide in peace and calm. This is a skill I wanted to teach the students. A task much more easily idealized than implemented. I quickly learned some breathing techniques that caught the attention of the students. Making their favorite breathing exercises a routine, or rather persistently reminding them of breathing takes quite a bit of practice. Next year I look forward to working with them on this so they can use these techniques without my prompt eventually. The feelings chart became a favorite of the students. Each day I would ask them how they felt. They grew to look forward to this. Even asking me, “ask me how I feel!” Some of them would also tell me stories about why they felt the way they did. I could feel them beginning to trust me and develop a relationship with me. Parents reported to teachers that students were naming and discussing their feelings at home! In April I took a yoga Teacher Training course for teaching children. I learned some great breathing techniques which the children loved. They also quite enjoyed the yoga and stories that went together. It was beautiful to see them engaged, moving their little bodies, breathing and having fun. This summer I spent more time engaged in the community. Volunteering at the Food Shelf I was able to be a part of an excellent resource for low income families and individual. I also became a client here. It’s great to both give service and receive the benefits. Then I don’t feel as though I am just taking. This experience has opened my eyes to the ability we have as citizens to make a positive impact in the community. Before AmeriCorps my perception lens was more clouded with self-involved tasks and abilities. I was more focused on achieving self-enhancing goals than I was looking at the community and considering what I could give. Now I have a new found sense of autonomy that I have very important skills to share, people to connect, and resources to share. From now on I will think of myself as a citizen with the capacity to appreciate the way things are and also take initiative to change things or introduce new ideas that can be beneficial to all. I hope that this opportunity introduces children and families to new self-regulatory techniques. Coming back to breath and conscious moving such as yoga are great skills for transforming afflictive emotions and being at peace. I’m quite grateful for the opportunity to cultivate these skills within myself and to also teach them to others.